What do these road markings mean? What do these road markings mean? Correct. This is a right-turn box or bay and it can only be used for turning right, not overtaking. However, you will need to give way to vehicles coming straight through. What is a right turn bay on a road? A right turn bay is an area where vehicles can wait to turn right without risking being hit from behind by moving vehicles, or holding up the traffic flow. You must not use a right turn bay to overtake a vehicle going straight ahead. The approach of a right-turn bay will be painted with a white triangle containing diagonal lines. You are permitted to drive over this to enter the turning bay and it gives you room to slow down. Right turn bays reduce the risk of nose-to-tail accidents because turning traffic doesn't hold up the main traffic flow. It's especially useful on rural roads where traffic speeds are higher. The area where vehicles wait is called the storage bay. In rural areas this is longer to accommodate more and longer vehicles, and to give a longer area for slowing down - usually 20m minimum as opposed to 10m minimum for urban areas. The storage bay is between 3-3.5m wide on rural roads and 2.5-3.5m wide on urban roads with a 3.5m being the desired width for all bays. They are marked with white reflectorised lines of 200mm width in rural areas or 150mm width in urban areas, with a white turn arrow in the bay. 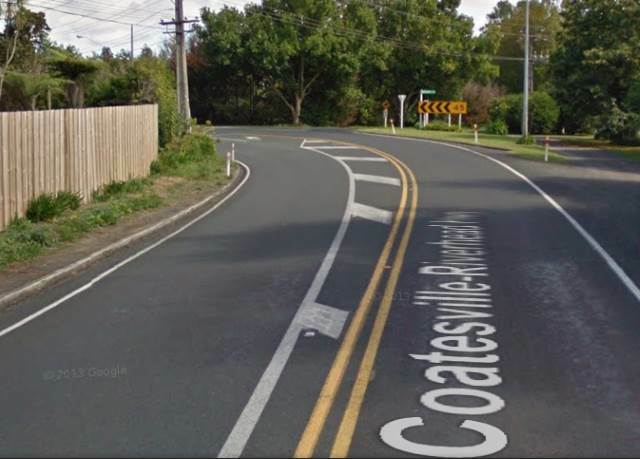 Right turning bays are not provided for every single turn off a rural road, just turns where there will be enough traffic to warrant it, or where a turn could be obscured by a corner such as at this intersection on the Coatesville-Riverhead Highway with Sunnyside Rd, north-west of Auckland.